Notice! Sibel Pansiyon does not accept reservations at this time. Please try again later. Sibel Pansiyon Contact. Sibel Pansiyon, located in Kaleici, in the city center of Antalya; welcomes its guests in a peaceful atmosphere surrounded by the natural beauties of the Mediterranean. It has 15 rooms and serves its guests in all rooms; satellite TV, LCD TV, air conditioning, bathroom, shower and wireless internet access. With a garden surrounded by palm trees, mulberries and orange trees, you can get rid of the stress of the city with breakfast made in the accompaniment of birds chirping. This is one of those small bed and breakfasts where the owner puts her heart and soul into making you feel comfortable. Sylvie, a delightful woman from France, couldn't be more helpful or caring. The pension's location in Antalya's old town is ideal for accessing great restaurants and shops, both of Antalya's tramways, and a beautiful park along the seafront. Breakfasts are served in a very charming garden and our room had the most comfortable beds of any place we've stayed so far in Turkey. it is clean, charming and very, reasonably priced. Bravo! Sibel Pansiyon accepts VISA and reserves the right to temporarily hold an amount prior to arrival. Sibel Pansiyon accepts Master Card and reserves the right to temporarily hold an amount prior to arrival. Sibel Pansiyon accepts Maestro and reserves the right to temporarily hold an amount prior to arrival. 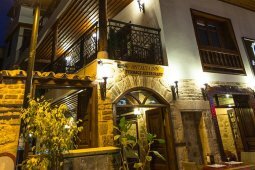 Sibel Pension rooms start at 14.00 hours. The departure time from the rooms is no later than 12.00. Tesise pet is not accepted. The use of open spaces that serve as testers depends on seasonal conditions. Sehr gepflegte und schöne Unterkunft mit freundlichem Personal. Gemütliche Zimmer, schöner Innenhof. Kann man empfehlen.